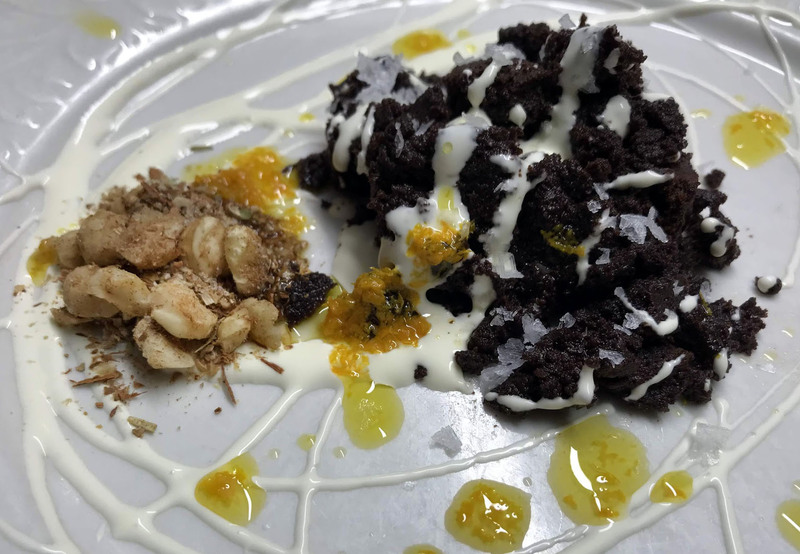 I recently made this dessert from one of my favourite chefs, Yotam Ottolenghi. 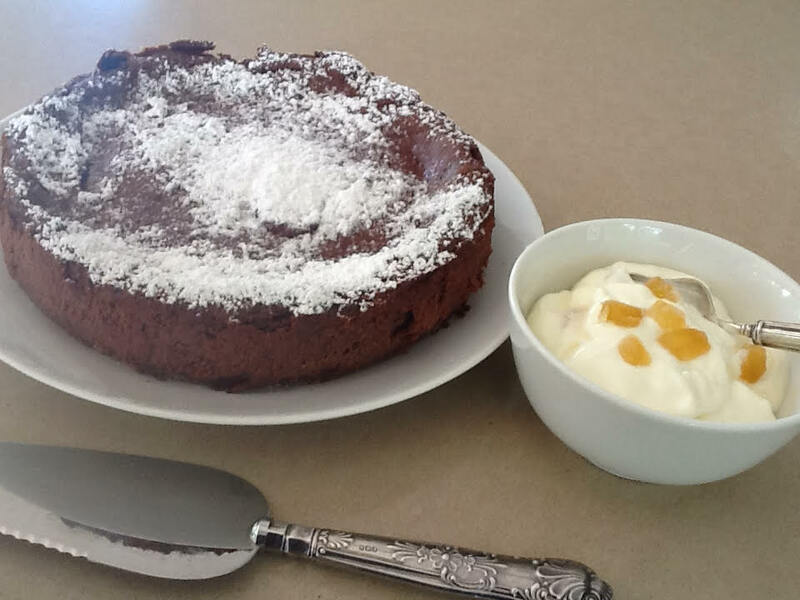 The flavour combination of chocolate, nutty spice mix, slightly sweetened crème fraîche and orange oil is amazing. But Ottolenghi says to bake the chocolate ganache and although I only baked mine for 8 minutes it was rather dry. And I don’t think you need the eggs or the sugar in the ganache. So the second time I made my usual chocolate ganache (which unlike YO’s doesn’t contain eggs, uses cream instead of butter and doesn’t contain any sugar) and I didn’t bake it. You could still plate it as above but I served it in little tea light glasses with the crème fraîche, nutty spice mix and a drizzle of orange oil on top, as you can see in the second photo. I doubled the orange oil as there wasn’t enough the first time. Ganache: heat cream to boiling point in a saucepan. Add chocolate broken into squares, remove from the heat and allow chocolate to melt. Stir till smooth then scrape into a shallow bowl, cover and refrigerate for several hours or overnight. Hazelnut Spice Mix: place all ingredients except sugar in a frying pan and stir for 2-3 mins until lightly toasted and fragrant. Transfer to a spice grinder or mortar and pestle and grind until fairly fine. Mix in the sugar. Orange Oil: place both ingredients in a jar with a lid and shake. Just before serving mix icing sugar and crème fraîche or sour cream. Don’t do this ahead of time as the sugar can make the cream go runny. Check the chocolate ganache and if it’s rock hard remove it from the fridge a couple of hours before serving. Arrange some hazelnut spice mix on 8 plates. Scoop a heaped tablespoon size portion of the chocolate ganache onto each plate, using a spoon dipped in hot water and re-dipping each time. Garnish with the crème fraîche and orange oil. Finish with a tiny pinch of salt flakes. Alternative way to serve: pour chocolate ganache into 8-10 small shot glasses or tea light glasses and refrigerate. 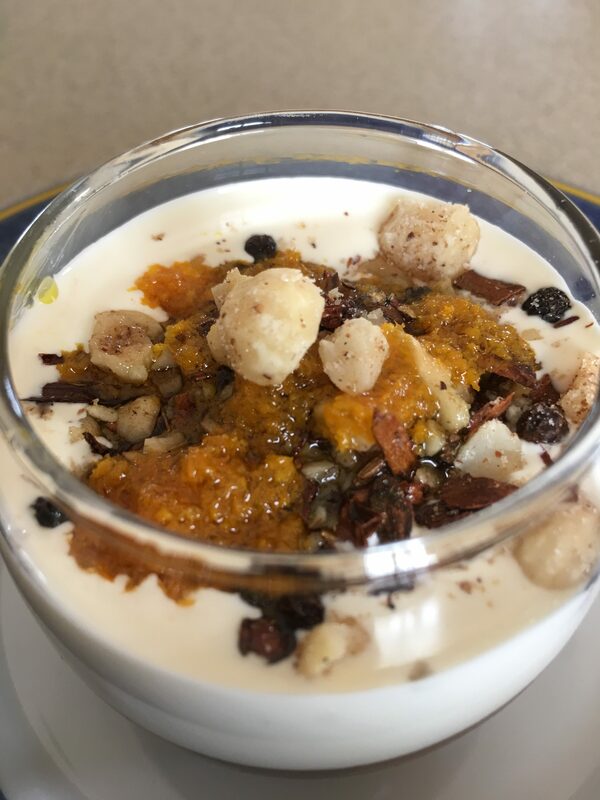 Serve topped with a dollop of cream, a sprinkle of the hazelnut spice mix and a drizzle of the orange oil. Finish with the salt flakes. When the kids were growing up I used to make a quick and easy chocolate sauce with a recipe from my mother in law. It goes well with ice cream, waffles and pancakes and disappeared faster than I could make it. On a recent trip to Denmark we spent a delightful weekend with our dear friends Vickie and Frants on the island of Fyn. Vickie served a delicious chocolate sauce with ice cream and when she explained the recipe I realised it was almost identical to mine, which I hadn’t made in ages. 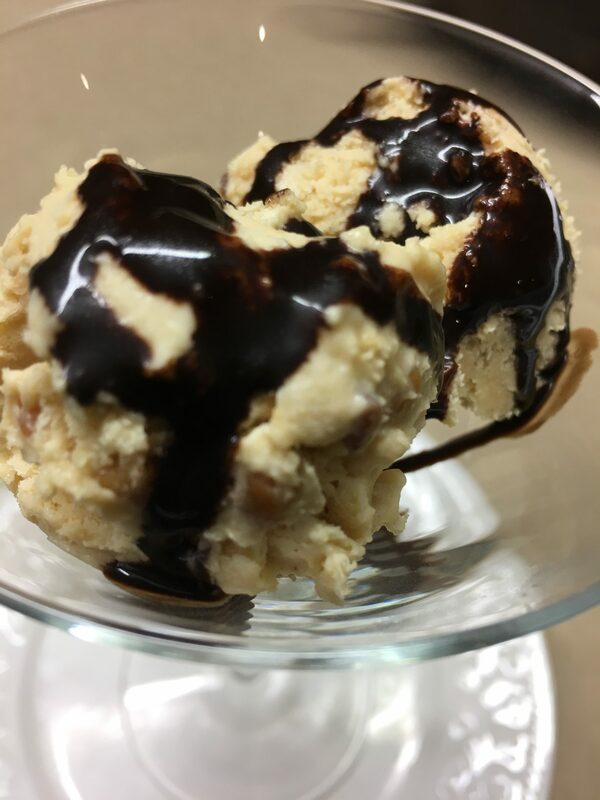 Last weekend I went on a bit of a cooking spree and made a few things for the fridge and freezer, including peanut butter ice cream and chocolate sauce to serve with it. For Matthew, not the kids who are long gone. The recipe makes about a cup of sauce, so if you have a house full of kids you might like to double it. If you can’t find golden syrup, honey or maple syrup should work. The ice cream is very quick to make and you don’t need an ice cream machine. For the ice cream, use electric beaters to mix the peanut butter with the sugar until smooth. Gradually beat in the cream and milk and continue beating until thick. Add the vanilla and salt, then scrape into a plastic container and freeze. For the sauce, place all ingredients except the butter and vanilla in a large saucepan, as it tends to bubble up. Heat, while whisking until smooth, then boil at a steady boil without stirring for 4-5 mins. Remove from the heat, add the butter and vanilla. Serve immediately or store in the fridge, covered and reheat in the microwave for about 30 secs. If it gets a bit thick add a tablespoon or so of water before heating. And if it’s too “dark” add some cream. Serve ice cream topped with the sauce. Matthew loves anything with salted caramel, so I knew this would be right up his alley. I used a 28 cm metal flan tin with a loose bottom. If your tin is a bit smaller the filling will be thicker and you may have a bit more pastry left. Use a shallow tin rather than a deep one you would use for a quiche. Make pastry according to the recipe at the link. Follow the instructions down as far as refrigerating for 15 mins. Bake 10 mins, remove paper and weights, then bake for a further 8 minutes (instead of 3 minutes), or until fully cooked and golden. Place macadamia nuts in a large non-stick frying pan and stir over moderate heat until slightly coloured. Spread over the base of the pastry shell. For the salted caramel, heat sugar and water in a saucepan over medium heat until sugar dissolves, then cook, without stirring but swirling from time to time, until it turns into a rich amber caramel (10-14 minutes). Carefully add cream and stir until smooth. Remove from heat and stir through butter and salt. Spoon evenly over the nuts in the tart shell, then leave to set. For chocolate ganache, bring cream and glucose to the boil in a saucepan then remove from heat. Add chocolate broken into squares and butter, stirring until melted. Allow to cool for a few minutes, stirring occasionally, until glossy. Spread ganache over the salted caramel, then stand in a cool place until set. Serve at room temperature or chilled with flakes of sea salt scattered on top. It’s very rich so cut into small servings. Whipped cream is optional. If I make a recipe and Matthew says he really likes it I never make it again. Well that’s his story, which is a real exaggeration. When he tells people this sob story I usually roll my eyes. 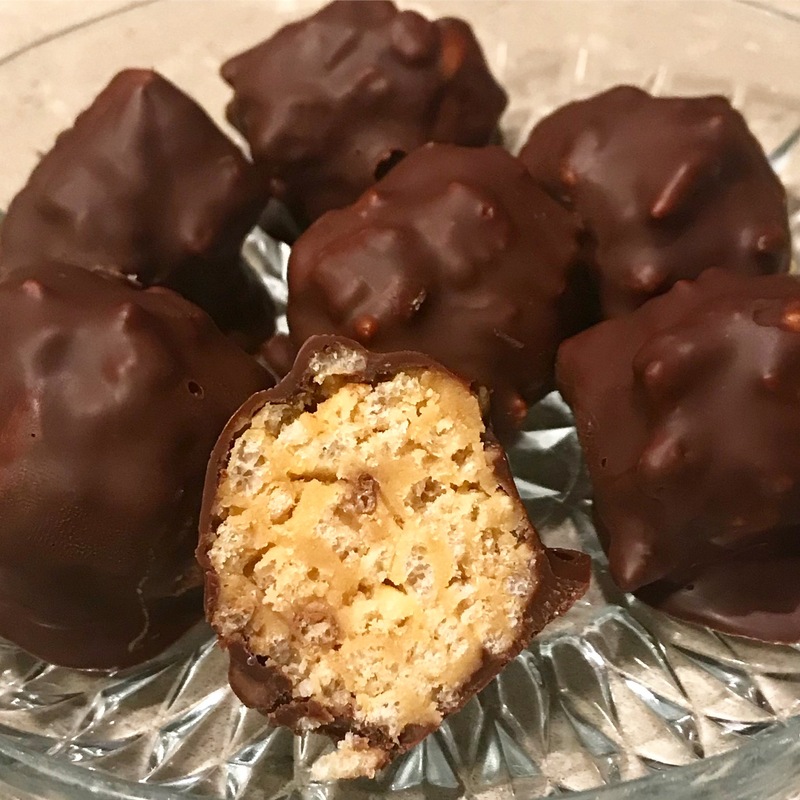 One of his absolute favourites is Peanut Butter Balls, which taste a bit like the American chocolates by Reece’s, called Peanut Butter Cups. If Matthew had his way I would make them every week, but they’re fiddly and time-consuming. Not the initial mixing, but the coating in melted chocolate. And they all disappear in no time flat. Once I made them a few days before friends came around for dinner. I was planning to serve them with coffee, but guess what, they had all disappeared. So the next time I sneakily put them in the freezer, but that didn’t work either. 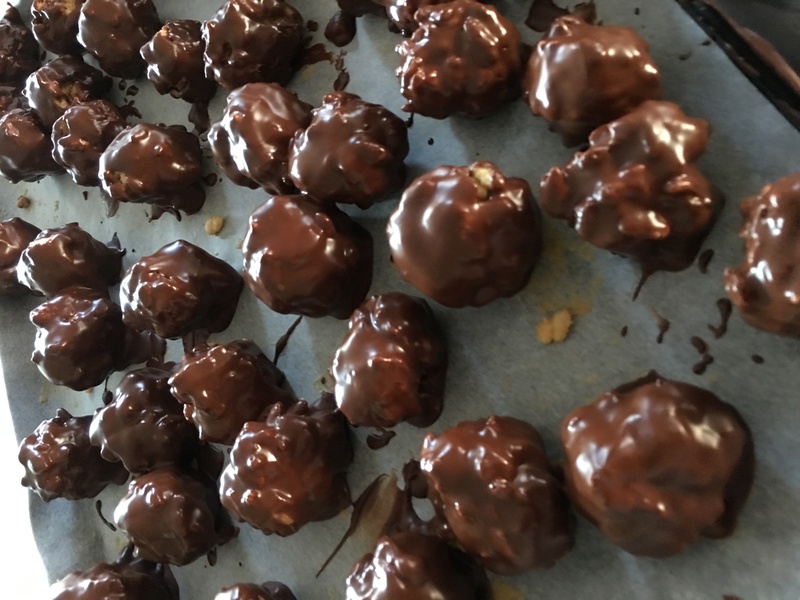 Matthew found them and informed me smugly that peanut butter balls thaw nicely in the time it takes to boil the kettle. So to put a smile on his face I made a batch for him to share with our son-in-law on Father’s Day next Sunday. Place peanut butter and butter in a bowl, cover then zap in the microwave for a minute or two to melt. Mix in rice bubbles and icing sugar then refrigerate for an hour or until firm. Line a baking tray or two with baking paper. Scoop out heaped teaspoonsful and arrange on the trays. Refrigerate again until firm, then use your hands to squeeze them into nice round balls. Put back in the fridge while you prepare the chocolate. Place chocolate squares in a bowl with the Copha or coconut oil over a pan of simmering water. When melted and smooth remove chocolate from the heat and take the balls out of the fridge. Coat each one in chocolate using two forks and leave to set on the paper-lined trays. Work quickly otherwise they will start to fall apart. Find somewhere to hide them in the fridge! This quick cake requires no baking making it great for last-minute entertaining. Serve it with raspberries or raspberry coulis and cream. Add a dash of brandy or a liqueur to the coffee mixture for a more grown-up flavour. It’s adapted from a recipe I found in an IKEA cook book. Cut butter into cubes and place in microwave-safe bowl with the chocolate, broken into squares. Cover, otherwise it will splatter. Heat for about 2 minutes on high, stopping halfway to stir, or until melted. Meanwhile place icing sugar in food processor and process to remove any lumps, then add the eggs. When mixed add the melted butter and chocolate and the vanilla essence. Line a loaf pan with foil or plastic wrap. If using a silicone pan you don’t need to line it. Spoon about 4 tablespoons of chocolate mixture into the pan and spread over the base. Dip each biscuit briefly in the coffee mixture before arranging them in the cake pan. Lay a single layer of biscuits over the chocolate, then continue alternating chocolate and biscuits, ending up with chocolate. Refrigerate for several hours or overnight. 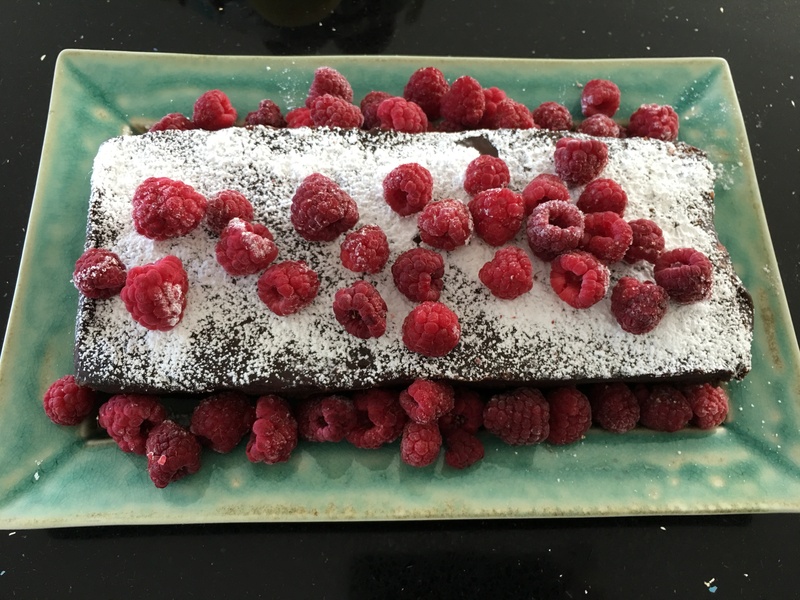 Remove cake from loaf pan, dust with icing sugar, then slice and serve with fresh or frozen raspberries or raspberry coulis and whipped or thick pouring cream. In 1915 Josef Keller, pastry chef at the Café Ahrend in Bad Godesberg in south-west Germany, invented the Black Forest Cake, using a local liqueur made with sour cherries to produce a distinctive flavour. His winning combination of chocolate and cherries went on to become famous around the world. Here I’ve used the same ingredients to make a quick and easy dessert, layered in a glass. For an authentic flavour it’s worth investing in a bottle of cherry brandy, but a dash of ordinary brandy or your favourite liqueur will do. I wanted to decorate each trifle with a fresh cherry, but tried three supermarkets and there wasn’t a fresh cherry to be had, it being mid-winter here. You can also make this trifle in one large glass dish. Slice cake horizontally and fill with a generous layer of cherry jam, then stick the two halves back together. You will need a third to half a jar of jam. Cut slices or chunks of cake and arrange a piece in 8 glass tumblers. If liked, drizzle each with a tablespoonful or two of cherry brandy or brandy. Place cherries in a saucepan with most of the juice and heat to boiling point. Mix arrowroot with the rest of the juice until smooth, then add this to the cherries and cook, stirring, until thickened. Spoon cherries over the chocolate cake. Place cream and milk in a small saucepan. Add chocolate, broken into squares, then heat to boiling point, stirring until chocolate has completely dissolved. 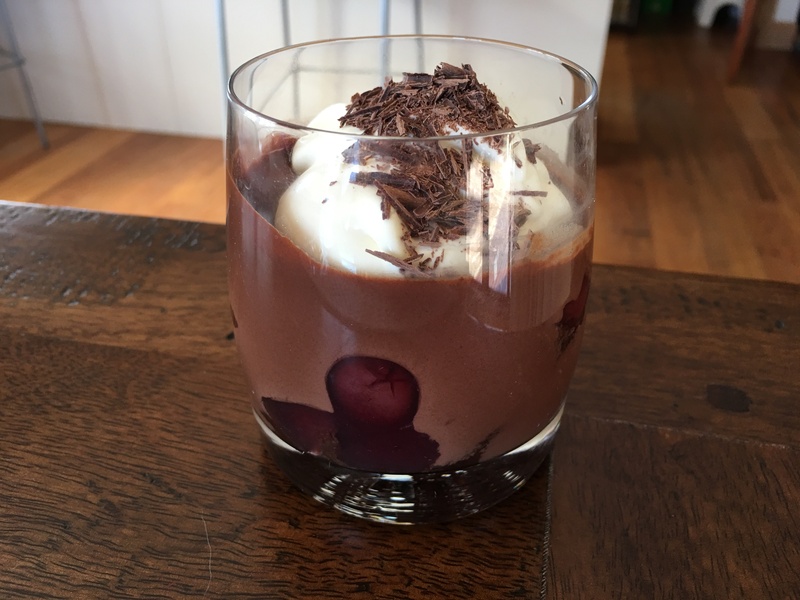 Spoon chocolate ganache over the cherries and shake glass to spread evenly. Desserts can be made ahead to this point and kept in the fridge, covered, for several hours or overnight. Whip extra cream until soft peaks form, then place a large dollop on each trifle. Decorate with a fresh cherry on its stalk (if available) and some grated chocolate. Variations: Use fresh pitted cherries, stewed with a little sugar, in season. Use milk chocolate instead of dark. Use a different red fruit jam. Arrowroot is available in the cake ingredients section of the supermarket. This chocolate fudge cake has been our family’s birthday cake for decades. Twice it was promoted to the status of a three-tiered wedding cake – once covered with dark chocolate ganache and shaved chocolate and the second time with white chocolate ganache. It continues to be the preferred celebration cake in our family. For the unenlightened, a Tim Tam consists of two layers of chocolate malted biscuit, separated by chocolate cream filling and coated with a thin layer of chocolate. These biscuits have become something of an Australian icon since their launch by Arnotts in 1963. Over the years new flavours and fillings have been introduced to keep up with modern trends. Tim Tams now come in dark or milk chocolate and with fillings such as salted caramel and peanut butter. Matthew is a staunch Tim Tam fan so I decided to use them to decorate his birthday cake this year. Unfortunately white chocolate ends up rather yellow as you can see in the photo – but it tasted good! Make the cake the day before the birthday as it’s much easier to ice next day. Preheat oven to 180°. In a fan-forced oven it’s best to lower the temperature to 170ºC so cake doesn’t rise too fast. Grease a 20-22cm round cake tin and line the bottom with baking paper. Alternatively use two shallow sandwich tins and line them both. Place all ingredients for cake in a large mixing bowl. Using electric beaters, mix well for 2-3 minutes. Use a spatula to scrape down any bits stuck to the sides of the bowl. Scrape mixture into cake tin and smooth the top. Bake for 35-45 mins in the centre of the oven, or until a skewer inserted in the middle comes out clean. Don’t overcook as you want the cake to be moist and fudgey. Two thinner cakes will take less time, around 25 mins. Cool 10 minutes in tin. Turn out and cool on a cake rack. Ice the cake the following day. Make Chocolate Ganache or Cream Cheese Icing – see below. Either ice cake just on the top and sides, or if you’ve cooked it in two sandwich tins use some of the ganache in the middle to stick them together. You can also cut one large cake in two horizontally with a serrated knife. If cake has risen into too much of a domed shape shave a bit off with a serrated knife. To ice cake in the middle as well as top and sides you will need to make one and a half times the Ganache recipe. With the cream cheese icing there should be enough. 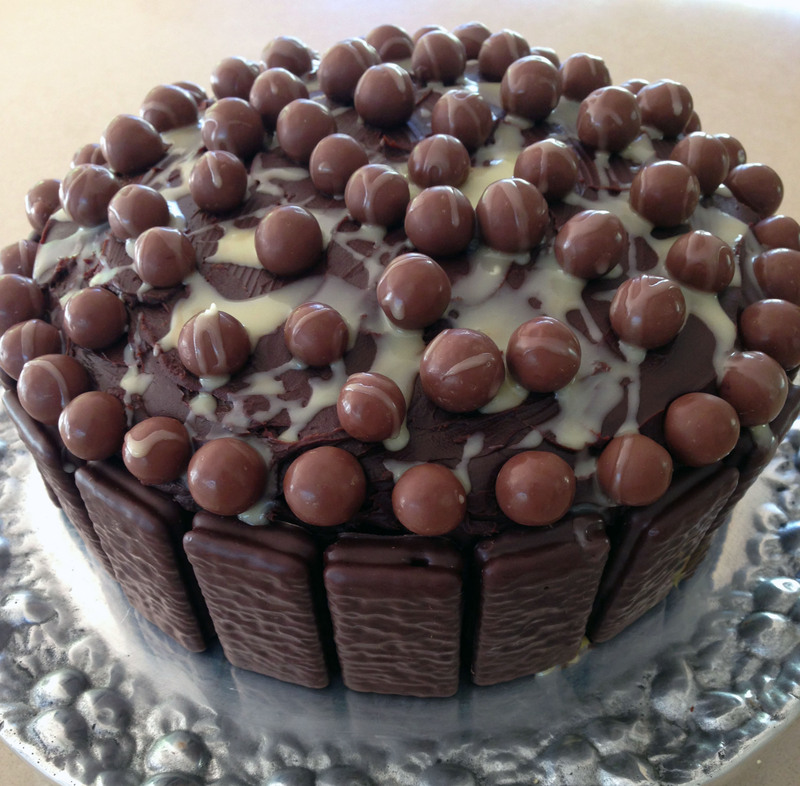 While the cake is perfectly nice without any adornment, if liked stick Tim Tams around the sides, cover the top with Maltesers and drizzle with melted and cooled white chocolate mixture. Cake keeps for 3-4 days in a tin. Chocolate Ganache: Heat cream in a small saucepan until boiling then remove from the heat and add chocolate, broken into squares. Stir to dissolve then cool until thick enough to spread over cake. Cream Cheese Icing: With electric beaters, beat butter and cream cheese, gradually adding the cocoa, then the icing sugar and enough milk to make desired consistency. Substitute: if you don’t have buttermilk use ½ cup plain yogurt and ½ cup milk or 1 cup milk mixed with 1 tsp vinegar and left to stand for an hour. Some of the grandkids like Nutella. I’m not a fan, but usually have it in the pantry for visiting Nutella eaters. This recipe makes a quick dessert and was a good way to use up a jar which had been sitting there for a month or two since the last visit. 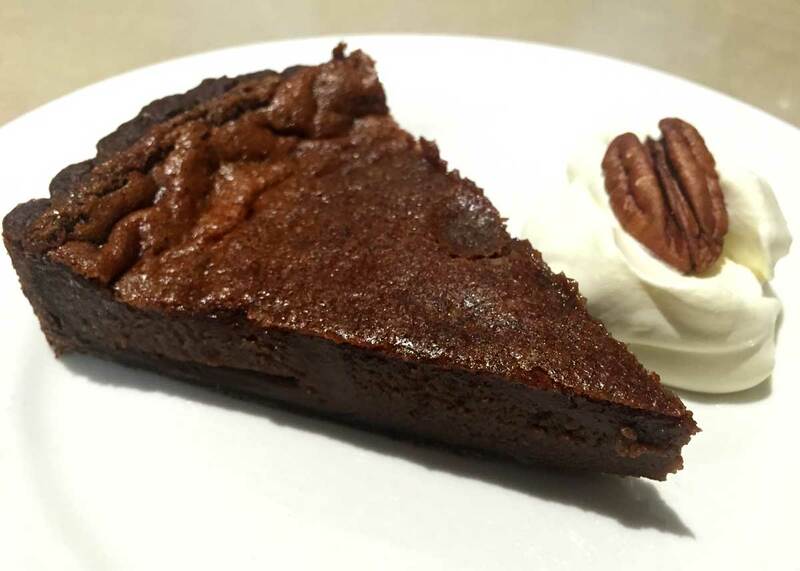 To save time you can use bought shortcrust pastry, but this home-made chocolate crust is very quick to make in a food processor. For pastry place first four ingredients in food processor and whiz until it forms crumbs. Slowly add water through the feed chute, with motor running. Stop as soon as mixture forms a ball. Remove and press into a ball, then roll out thinly and use to line a 20cm (8″) metal tart tin. Refrigerate for up to an hour. If in a hurry stick it in the freezer for a few minutes. Preheat oven to 180°C. 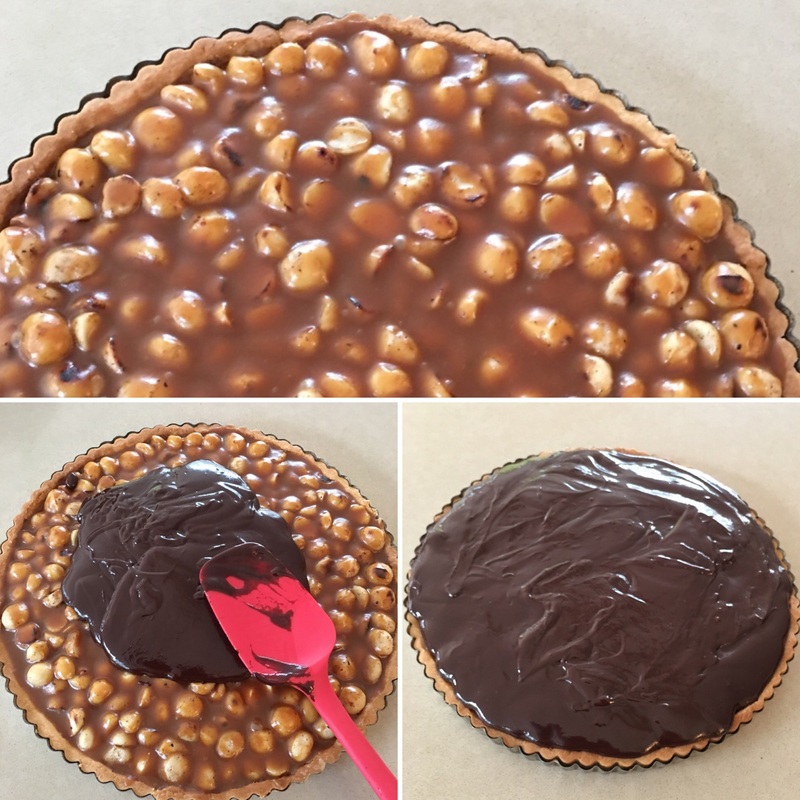 Line tart with foil and fill with dried beans or corn to stop it rising. Bake for about 8 minutes, then remove foil and beans (which can be kept to use again and again) and put back in the oven for 5-10 mins or until set. Remove from the oven and turn it down to 150°C. Meanwhile for the filling, place eggs in a bowl and beat with a hand whisk. Whisk in Nutella and cream and when smooth pour into the tart case. It should come almost level with the top of the pastry. Bake for 30-40 minutes or until set, but still wobbly in the middle. Don’t overcook. Cool then refrigerate till serving time. Serve with whipped cream and toasted nuts. With a food processor this dessert is quick to make. Really chocolatey and not too sweet. Pre-heat oven to 170°C. Place biscuits in food processor and process until fine. Melt butter in microwave, mix in biscuit crumbs then tip into a 20cm (8″) springform pan which has been greased and bottom lined with baking paper. Press the mixture evenly over the base of the tin. Bake for 10 mins. While biscuit crust is cooking make filling. Wipe out the food processor. Place all ingredients except ginger in processor and mix till well combined, stopping to scrape down the sides halfway. Add chopped ginger and process briefly, just to combine. When ready remove biscuit base from the oven tip in the filling and smooth the top. Return to the oven for 30 mins or until just set, but still a bit wobbly when shaken. Cool cheesecake, then refrigerate several hours or overnight. Dust the top of the cheesecake with icing sugar. Serve with Labneh or whipped cream, with some chopped ginger and a little icing sugar mixed in. Many moons ago I was in Spain for the first time on a school exchange when my host family took me to an establishment which served churros and nothing else. The queue of people waiting to be seated went out the door and halfway up the block. Always a promising sign. We eventually sat down to a huge plate of warm crispy churros rolled in cinnamon sugar which was placed in the middle of the table. We each had a mug of very thick hot chocolate to dip the churros into. And I mean thick – you could almost stand your spoon up in it! I was hooked. Like eclairs and profiteroles, churros are made from choux pastry, but instead of cooking them in the oven they’re fried in hot oil, like doughnuts. I have a special gadget for pushing the dough through, but a piping bag with a large star nozzle works just as well. 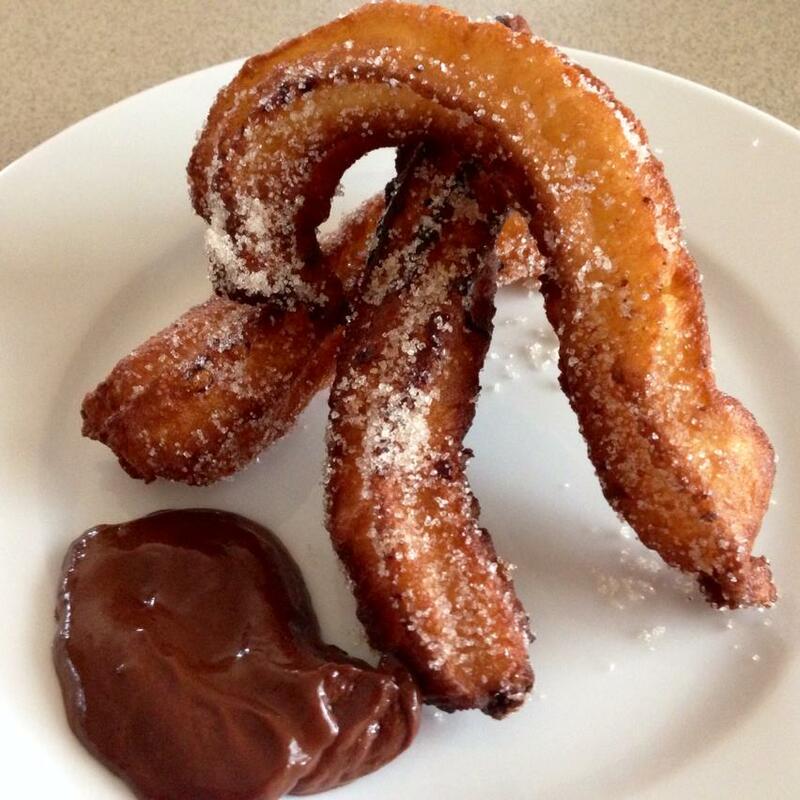 Instead of a mug of thick hot chocolate serve the churros with a simple dipping sauce made from cream and chocolate. For a more grown up combination try them with salted caramel sauce. Either way they are delicious. In a non-stick saucepan heat milk, butter and sugar until boiling point is reached. Remove from the heat and add the flour and baking powder, all in one go. Beat well with a wooden spoon until lump-free and mixture leaves the sides of the pan clean. Return to the heat and cook, stirring for 2 mins. Remove from heat and add the beaten eggs gradually, beating well after each addition. Cool. Heat oil in a large deep frying pan or deep fat fryer. It should be at least 4cm deep. Place some of the mixture in a piping bag with a star nozzle or in a special churros gadget. When oil is hot pipe in the churros a few at a time, using a knife to cut them off when they are 10-15cm long. Cook, turning once, till golden on both sides, then remove from oil and toss in a mixture of sugar and cinnamon. Serve warm with chocolate or salted caramel sauce. Chocolate Sauce: heat cream until boiling point is reached then remove from heat. Add chocolate broken into squares and stir until melted. Cool a bit and serve warm. Salted Caramel Sauce: melt sugar in a small heavy-based pan until melted and dark caramel colour, swirling the pan from time to time. Add cream and butter and mix until smooth. Cool a bit and serve warm. Can be reheated.